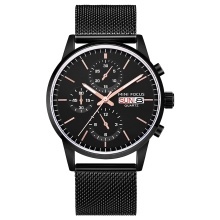 This is a fashion men watch. The watch is suitable for all kinds of occasions. It shows your unique style. Hardlex crystal mirror and stainless steel strap, comfortable to wear. It has calendar, week, time display and luminous hands. Perfect for many occasions, showing your charms at all times!